Fresh, fast and summery, scoop up this strawberry avocado salsa with crunchy tortilla chips or serve it alongside grilled chicken or pork. Fresh summer fruits and vegetables -- there really is nothing better in my book. They just make you feel like you're eating healthier (because you are!) while also totally winning because of all the amazing, practically-warm-from-the-sun flavor. Seriously. I go crazy over summer fruit: strawberries, cherries, blueberries, raspberries, peaches, apricots, nectarines. Gaaaaaaaaaaah!! I'm already freaking out just thinking of all the ways I can eat them. And preserve them for the fruitless (literally), tasteless winter months. 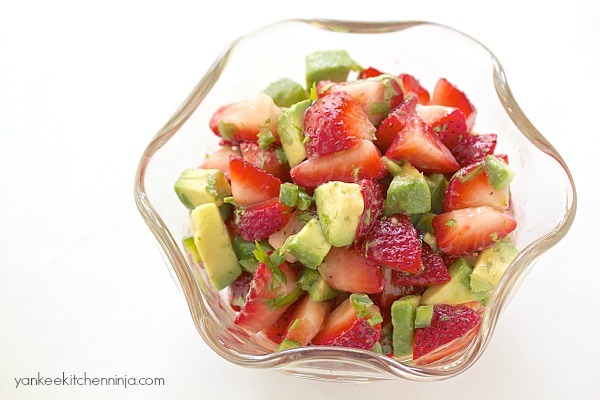 One awesome way to eat some of your pick-your-own strawberry haul is this strawberry avocado salsa. I'm torn about how to recommend it to you: while we eat it as a condiment alongside grilled chicken, it's really just as good as an appetizer or snack, scooped up with crunchy tortilla chips. So, as you can see from the-cheese-stands-alone photos, I'm not going to influence you. I'm letting you decide how you want to eat it. Or just serve a bowl at your next BBQ and let your guests decide. But you are going to want to eat it, trust me. Especially since it's so simple -- only five ingredients and about five minutes to prepare. And, tell me, what dish isn't better with avocado? This salsa is no exception. 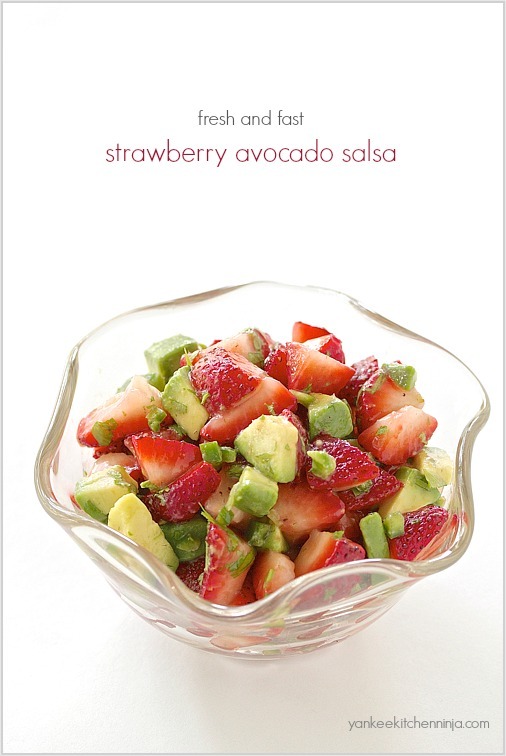 The cool smoothness of the avocado is the perfect complement to the bright tanginess of the strawberries, and it's all rounded out with some cilantro, a little jalapeno pepper kick and a squeeze of fresh lime. It's super fast, super colorful, super fresh and super delicious. Have I sold you on this strawberry avocado salsa? How do you like to eat fruit salsas? Leave a comment: The Ninj wants to know. Combine all the ingredients in a bowl and mix gently. Serve, then store any unused portion in an air-tight container. Thanks so much -- hope you enjoy it! I will be making this! It contains all of my favorite ingredients! 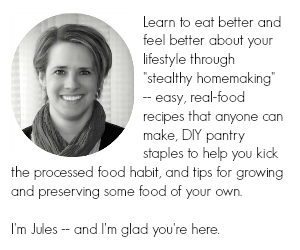 I'm so happy, Michelle -- enjoy! That's some seriously fantastic, salsa, my friend! I love the idea of this with a grilled pork chop!! This one is on my list! And you know I'm all about how easy it is, Bill!